Effective educators respect their students. I write this (in part) as an homage to certain individuals and teachers who will forever stand out in my life as people who taught me this lesson through example. I believe showing children respect is elemental to nurturing their growth. Part of respecting another person – particularly a young person – means equipping them with the appropriate information, and allowing them to make decisions for themselves. Of course there are times when adults need to make the decisions, I’m not disputing that. But kids need choices too. How will they learn to think and take responsibility for themselves if we don’t allow them to practice weighing their options? This is the approach I took when I told Mr. 7 that I’m getting married next year. “Teddy Bear & I would love for you to be in the ceremony with us,” I said, Teddy Bear being the kids’ nickname for my fiance. “I dunno Mo, I’ve never been to a wedding before,” Mr. 7 said, brow furrowed. “What would I do?” he asked, a nervous smile spreading across his face. 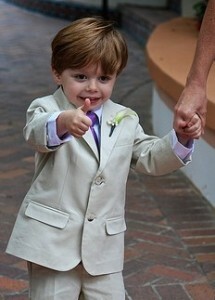 “Who’s the flower girl going to be?” he asked, the beginning of many questions. “Oh. Cool. Would I have to walk down the aisle?” he asked, fidgeting. “No, you’d be standing up front with Teddy Bear & the men.” (He smiled. Big.) I went on to explain that the day before the wedding we’d get to practice everything a couple of times so he would know exactly what to do. The next morning, Mr. 7 stood on the stairs in front of me while we waited for the little ones to find hiding spots for our game of Hide N Seek. “Hey Mo, I’ve made up my mind,” he said. He stood a few steps up from me so we were eye to eye. “Thank you, Mr. 7. I’m honored. There’s no one I’d rather have,” I said as he fell onto me. I gave him a spin-hug, and next thing we knew it was time to seek out the munchkins. Nothing else needed to be said. It would have been easy for me to try to talk or coax him into it. 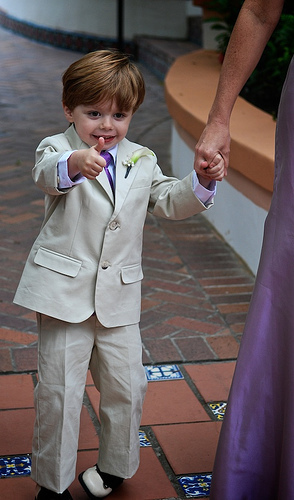 It would have been easy for me to put subtle pressure on him in a million different ways, because let’s face it, I love him and want him to be the ring bearer when I get married. But this wasn’t about me getting what I want. It was about inviting someone I care for to take on an important role in my wedding day. It’s understandably intimidating, which is exactly why the decision had to be his. Whatever choice he made, he needed to own it. And that’s precisely what he did. Not only did Mr. 7 ask a million questions to understand what was being offered, he took time to think about the invitation, weigh the options and reflect on what felt right for him. I knew that I might not get the answer I wanted, but for me the process was ultimately more important than Mr. 7’s answer. I believe showing children respect is elemental to nurturing their growth, and part of this means giving them the power of choice – even if they choose something I’m not thrilled about. People learn to respect others when we are shown respect ourselves, and that’s particularly true of kids. I don’t always get it right, but that’s one of my guiding “north star” principles as an educator – and as a person. What does respect mean to you? …to your kids? Ask them & find out, then share your comments & conversations here!